What is the one surname in your family tree that you dread researching? As family historians, we love researching unique surnames because those people are easier to find and we don’t have to worry about finding two people with the same name. Surnames, of course, are key to genealogy research. 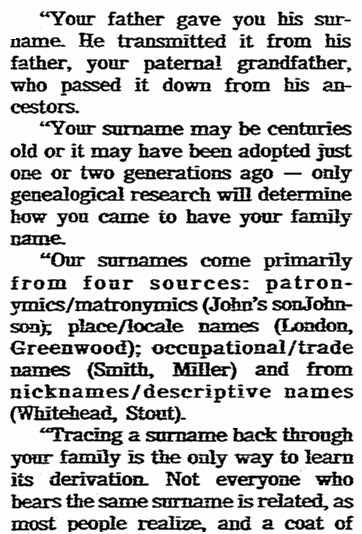 In a newspaper column she wrote in 1985, genealogist Myra Vanderpool Gormley explained the importance of surnames. Chances are you have at least one very common surname in your family tree. One of mine, and possibly one of yours, is Smith. Pair that Smith with a popular first name like Mary Ann or William and you have a difficult family history project. While it seems obvious that Smith has long been a common surname, I wondered: with our growing diverse population, was Smith still at the top of the list? The answer, according to the U.S. Census Bureau, is a resounding yes. For now, Smith remains the #1 most common surname in the United States. In fact, for the last 20 years the three most commons surnames found in the census are: Smith, Johnson, and Williams. As you look over this list, do you see any of your family surnames? Any surprises? What’s the one surname you have the most trouble with that seems to be universally common, or common to the area you are researching? Share it with us in the comments below. * “Hello, my name is…,” United States Census Bureau (https://www.census.gov/library/visualizations/2016/comm/cb16-tps154_surnames_top15.html: accessed 4 April 2017). *** “Frequently Occurring Surnames in the 2010 Census,” United States Census Bureau (https://www2.census.gov/topics/genealogy/2010surnames/surnames.pdf : accessed 3 April 2017). Genealogy Tips: How Popular Is That First Name? Dyed Easter Eggs? Make Deviled Eggs! My maiden is Thomas, a tough name to track. I’ve made it from New Jersey, back to New York, Massachusetts, Maine and that’s where it ends. If my research is right, Rebecca Nurse would be my 7th great grandmother though my dad’s family. Beyond that, I am stuck. You do have one of those popular surnames which requires a researcher to spend extra time to sort out those with the same first name. It sounds like you’ve made some progress.